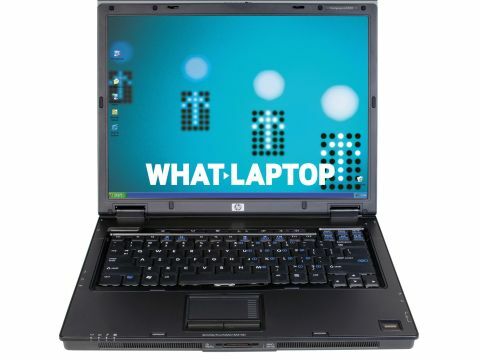 HP is one of the most respected developers of business laptops. Combining strong usability with powerful performance is the HP Compaq nc6320. With an understated black chassis, the corporate look of the HP suits its business audience. At 2.8kg, it's heavy, but strength and build quality are excellent. Providing screen protection, rubber pads at the front of the keyboard keep the 15-inch TFT screen safe from damage. It's a logical touch for frequent mobility, and other manufacturers should take note. Day-to-day usability is impressive. The keyboard is sturdy and responsive, making touch-typing comfortable at all times. Similarly well designed is the touchpad and mouse buttons, with the latter formed from rubber for extra grip. Running at 2GHz, the Core Duo T2500 chip of the HP is backed up by 1,024MB of DDR2 memory for powerful performance. A score of 243 points from MobileMark tests means even high performance applications will be well catered for. Equally, battery life is intended for mobility. Running for 236 minutes while driving MobileMark 2005, nearly four hours of use can be had from a single battery charge. Aiding performance is the high-quality screen. The lack of a Super-TFT coating is common for a business laptop. However, its high SXGA resolution of 1,400 x 1,050 pixels ensures images are sharp and makes the most of the screen space. Storage space for business files is provided by an 80GB hard drive. Spinning at 5,400rpm, data access speeds are fast. As with all laptops on test, a fingerprint reader is provided for securing important data with unique biometric protection. Rounding out the specification of the system is comprehensive network connectivity. High-speed Gigabit Ethernet connections can be configured, and 802.11a/b/g Wi-Fi allows for fast wireless transfers in the UK or overseas. The model we tested was a pre-production unit and the final release will differ slightly at this price. The processor will be an Intel Core Duo T 2300 and the screen will have a lower resolution of 1,024 x 768 (XGA) pixels.